What are the subtypes of mesothelioma? There are three main subtypes of mesothelioma: sarcomatous, epithelioid and biphasic. 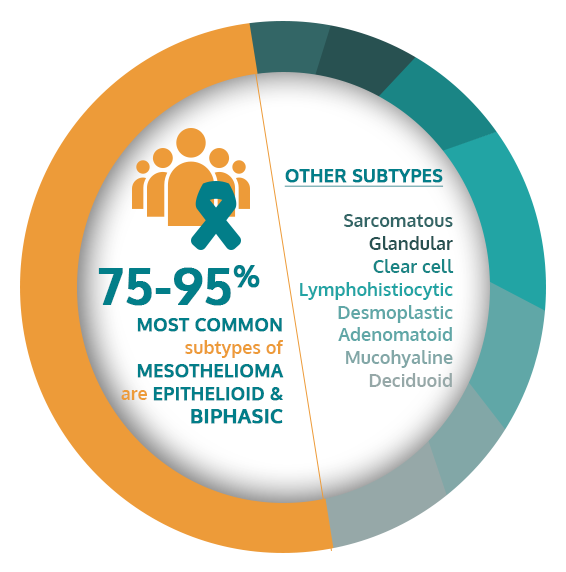 The last two are the most common ones, representing 75-95% of the mesothelioma cases, while sarcomatous type has not been studied very much. Also, in most of the cases, mesotheliomas are characterized by high levels of cytokeratin 5 no matter the subtype. glandular, clear cell, lymphohistiocytic, desmoplastic, adenomatoid, deciduoid, mucohyaline.